This 1889 Gothic style structure replaced an earlier church on the site and was built to serve the growing Polish community. Next door, Mother Seton Academy educates children in the original parochial school building. The Hall around the corner at 1727 Aliceanna Street served as the 1912 strike headquarters for longshoremen. During the strike, AFL president Samuel Gompers came to the hall and spoke in support of their demands for unionization. Longshoremen met here again in 1936 to support a wildcat seamen's strike. 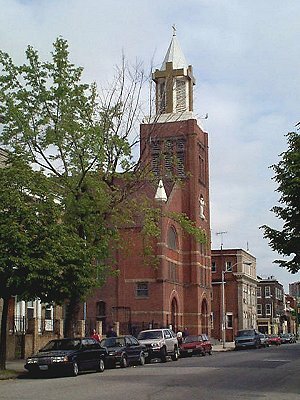 The many ethnic churches of Fells Point, like St. Stanislaus, provided the continuity of language, religion, and culture to newly arrived immigrants coping with the shock of forging new lives in a new land. From A History of Polish Longshoremen & Their Role in the Establishment of a Union at the Port of Baltimore, by Thomas L. Hollowak.